Ted Pelkey runs a monofilament recycling and truck repair business with his son. For years, he says he's been trying to move his business from Swanton, Vermont, to Westford. To do that, he needs a permit to build an 8,000-square foot garage on his property in Westford. But the town has been giving him issues. "We've been trying to put a business there for the past 10 years," Pelkey told the Burlington Free Press. "It's just never-ending. They're railroading us really good," he added, explaining that his business is "a low-impact thing" with "such little traffic you'd wonder if we were open." The Westford Selectboard and Development Review Board had denied Pelkey's requests for the large garage, asserting that his applications did not meet the town's standards for a variety of reasons. Among them, Pelkey's application lacked necessary information about lighting that will "likely be needed for security purposes," and did not effectively describe the purpose of the building, officials said. Pelkey isn't buying it, instead claiming the town review board is biased against him. "The strain (with local officials) has been there for 10 years," he told the New Haven Register. "They don't like us." Eventually, Pelkey decided to take action. "I was sitting at a bar and said to my wife, 'Hey, I want to get a statue made of a middle finger, and I'm going to put it up on the lawn,'" he told Boston.com. So that's exactly what he did. 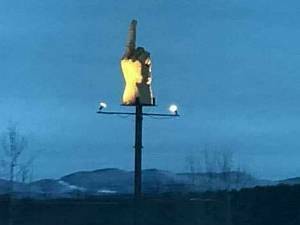 Pelkey commissioned a Vermont artist to carve a 700-pound, wooden sculpture of the middle finger. On November 30, he had it installed in his yard, complete with two floodlights so that it's visible 24/7. All told, the project cost about $4,000. "If you don't want to look at the building, look at this," he told Boston.com. Here's the kicker: The town may be able to stop him from building his garage, but there's not a single thing officials can do to force him to get rid of the middle finger statue. While the state of Vermont doesn't allow "off-premise" billboards, the sculpture isn't actually advertising anything. Instead, it's considered public art, which is protected under the First Amendment. Pelkey is not breaking a state law, and according to Westford Selectboard Chair Allison Hope, he's not in violation of any local regulations either. "The Pelkeys can do what they like to exercise their free speech within the laws and regulations," Hope told the Burlington Free Press. So the middle finger will stay up, at least for the foreseeable future. Pelkey's attorney has appealed the review board's decision regarding construction of the garage, with a court hearing possible next month. Hopefully, Pelkey will be able to build his garage—it's his own property after all. Even if his efforts fail, we applaud him for taking matters into his own hands and exercising his right to freedom of speech. I'm sure there have been times when we've all wanted to flip off the government. Pelkey simply took things to the next level.